It’s kind of a big deal to me. I need to figure out what I can do to celebrate. If you want to send in any fan art, though, that’d be swell! Happy Fifth Birthday, the Forth! Three kisses t(w)o say you are number one! Zero! Smithy may not have a weapon, but he can still mop the floor with Skärva. @The alt-text: Derk’s here to watch the sparring, of course! Do you know what the 180 rule for camera directions are? They are mostly used for film and animation, but they can also be useful for comics. I highly suggest taking a look at the tutorial. It seems weird that they suddenly switched places in that last panel, and they should probably be switched back. Nothing weird about it to me — in panel six, Skärva is holding the sword in the hand far from the “camera”, and in panel seven, it’s in the near one. It’s pretty obvious what has happened, and the motion seems natural. If Skärva were still on the right in panel seven, we’d be seeing his back and not his face as he reaches out with his left hand to grasp the broom. More generally, I think the instructions you linked to overstate the danger. If there is ever an actual possibility of the audience becoming confused by characters switching sides on screen, then the real problem is there being way too many cuts in the scene. Thanks for the feedback, both of you. I didn’t think it was too confusing that the “camera” was on the other side now, and wanted to change the positions of the characters to create a mirror for the first panel. But Victor said he thought it was weird too. I’ll consider changing it tonight. Or perhaps later when I’m doing the “special edition” of this arc (tweaking things and possibly redrawing several whole panels that could be better before we try to print it). Right now I just want to keep moving and power through this story as fast as possible! It may well be that the effect of such a swap varies significantly from person to person; how commonly it’s a problem I don’t know. Looking at the Wikipedia article on the subject, I get the feeling that the effect is strongest when there’s movement in the scene–which there’s little of here. I can very much see a one-eighty flip being disorienting in a situation in which there’s significant movement–characters entering or leaving the frame, changes in relative position or direction, etc. For what it’s worth, I don’t believe that I found the swap in the last frame to be at all odd. Skärva really is a bad student, isn’t he? Yeah. He’s always been quick to grasp a lot of things, especially magic, so he thinks he’ll be that good with everything. Wow, that time of year already? I guess I should do some fanart. That’d be awesome! :3 If you want! Had to go back on a few pages to confirm this… but I love the subtle change you make on Skarva’s eye color to reflect moments where he’s burning with rage. Now I’m fearing it’s a detail I haven’t been noticing all this time! Yep! They get orange when he’s furious and they get brighter purple, even to pink, the more excited he is or when he’s using magic. I haven’t done it throughout the whole comic, but for a long time. It’s not just a coloring thing either, it would happen in reality. It’s because he’s so magically attuned. 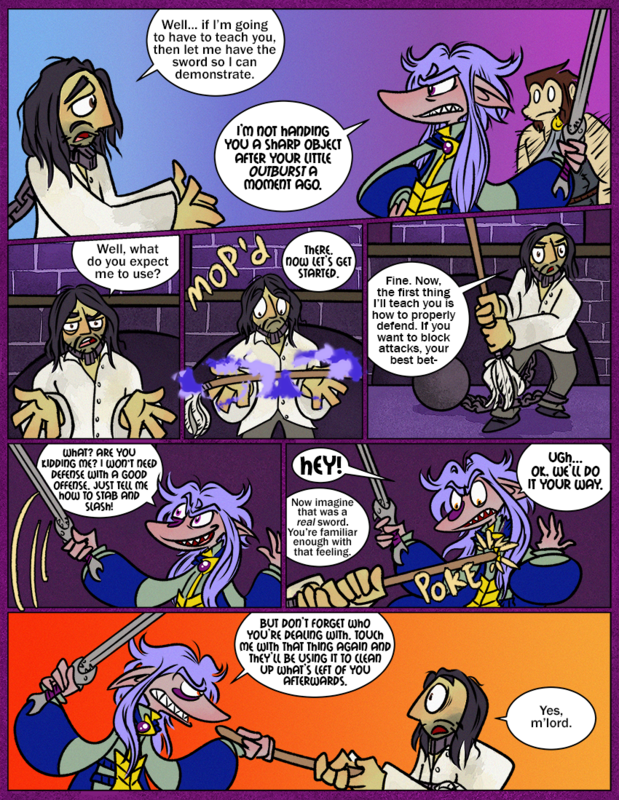 Hmm, I don’t suppose this is that one lesson in swordfighting Skarva mentioned he’d taken way back in the piratey arc?